This post is by Ashlee Clark, a person who is equally hysterical and spiritual! I don’t know why bad things happen, and I wish that I could make sense of them, but most of the time I can’t. I haven’t even been able to make sense of the bad things that have happened in my own life. But through all the trials I have faced, and all the times I wanted to give up, there was something that kept me holding on... Hope. 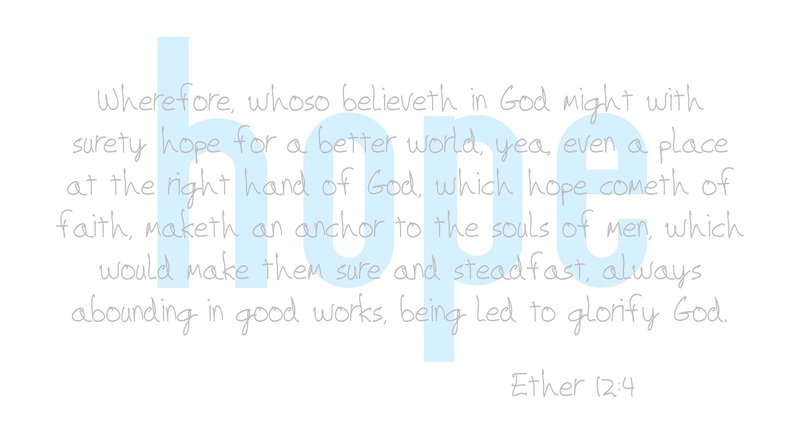 Wherefore, whoso believeth in God might with asurety hope for a better world, yea, even a place at the right hand of God, which hope cometh of faith, maketh an anchor to the souls of men, which would make them sure and steadfast, always abounding in good works, being led to glorify God. I know that no matter what happens in this life, no matter how many senseless acts of violence and countless people try to take away our belief in humanity that we can all have this hope for a better world. If nothing else, we can have hope because of our belief in Jesus Christ. I am an average Mormon… And I wouldn’t have it any other way.